You can save big on Antarctica Cruises and Fly Cruises onboard the Akademik Vavilov & Akademik Ioffe cruises to Antarctica Peninsula, Falkland Islands, South Georgia and even the Weddell Sea. 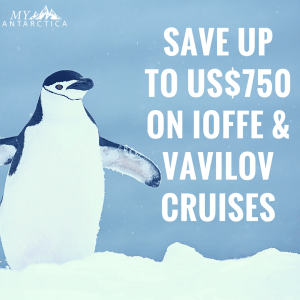 Save US$750 off Antarctica Trips on specific Ioffe & Vavilov departures for next season. In case your departure didn’t make the list, you can still save US$500 on all other Ioffe & Vavilov departures. Check out the cabins, prices, itinerary details for each cruise on the Akademik Ioffe here. View all the dates, rates and cabin details for the Akademik Vavilov here. These offers are based on new bookings made before 31 May 2017 and are highly subject to availability. All voyages that start or end in Stanley (Falkland Islands) and King George Island (Antarctica) include charter or schedule flights. Clients must arrive in Punta Arenas the day prior to embarkation. For voyages that end in King George Island and return to Punta Arenas, a complimentary hotel night in Punta Arenas is included at the end of the voyage. Speak to an expedition specialist or request availability here.